We all know good data and analytics are vital. They provide the foundation for every good business decision you’ll ever make. But how can you bring data together from across your organization (or wider) quickly enough to deliver value? What’s holding people back from integrating their data, connecting the silos, and building better analytics? 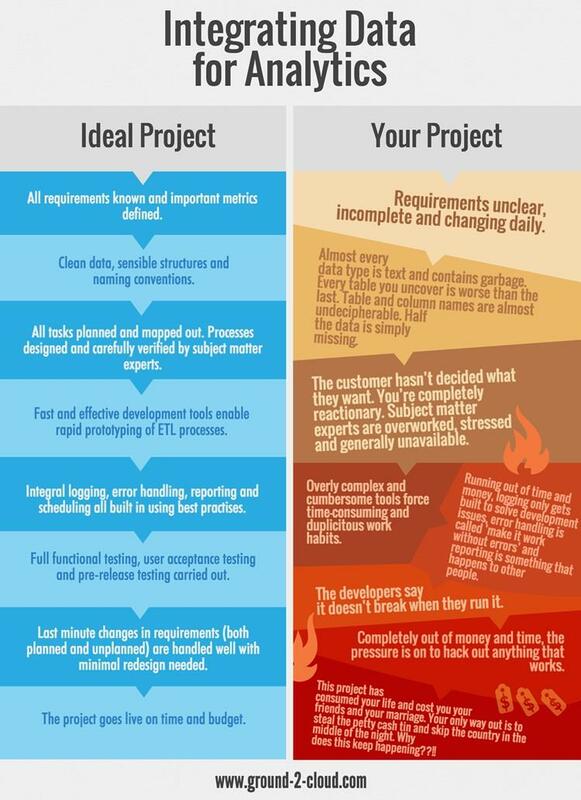 The problem is, the majority of analytics projects bog down in the integration phase. Often this is enough to kill the project and write-off any benefits. After all, good business analytics starts at the beginning – with good data management and integration. But, data migration projects are infamous for being difficult, unpredictable and fraught with issues. A study of the ICT industry conducted by the TM Forum found 50% of respondents ranked integration as the biggest potential barrier to Big Data and analytics success – well above skills availability as well as the cost and complexity of technology solutions. But, these findings are hardly surprising given the reputation integration projects have earned. Another study by Bloor Research found the failure rate for data migration and integration projects was a staggering 38%. The best way to avoid this disaster is to look for the fastest, low-risk, way to integrate your data. This means selecting an integration tool that enables you to achieve early wins to keep the analytics team happy, while allowing you to work through any major errors without having to rewrite code. This was a guest blog contributed by Jason Gleason at Eight Wire, a company that builds tools to make data migration easy. For more blogs and infographics like this, check out www.ground-2-cloud.com.